Ranked No. 1 on watchdog Open Doors' World Watch List for 12 consecutive years as the worst persecutor of Christians on the globe, North Korea is estimated to have imprisoned between 50,000 and 70,000 Christians for failing to revere their "Dear Leader," the title initiated by previous dictator Kim Jong-il and adopted by his successor and son Kim Jong-un, as a god. "It is safe to say that nothing has improved for Christians since Kim Jong-un took over power," Open Doors states in its 2014 World Watch List featuring 50 countries where persecution of Christians for religious reasons is most severe. 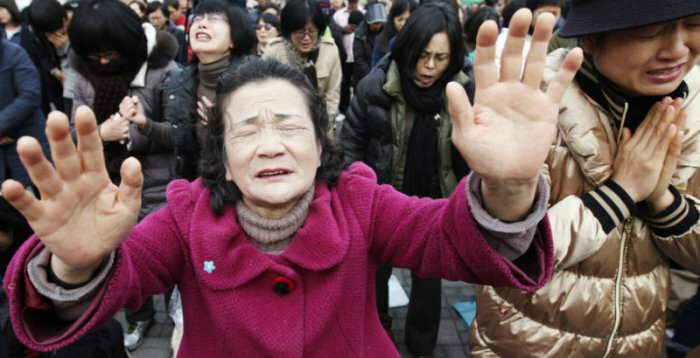 There are an estimated 300,000 Christians in North Korea, officially known as the Democratic People's Republic of Korea. Open Doors adds, "The God-like worship of the rulers leaves no room for any other religion. Any reverence not concentrated on the Kim dynasty will be seen as dangerous and state-threatening. Not only will the believers themselves be punished if they are discovered, but likely also their families. Immediate family members, even if they aren't Christians themselves, will serve a sentence in a re-education camp. Christians are sent to political labor camps, from which there is no release possible." When not hosting basketball clinics with former NBA champs, allegedly diverting food aid from its starving populace, conducting nuclear tests, building multi-million dollar monuments, or executing "treasonous" family members in reportedly the most vicious of ways, the North Korean oppressive-paranoia machine is busy wrangling, imprisoning, and killing citizens who stray from the dictatorial demands of its Juche ideology's "Ten Great Principles," or commandments. "The 'Ten Great Principles of the Establishment of the Unitary Ideology System' is the highest norm that governs the daily lives of North Korean people," according to the Citizens' Alliance for North Korean Human Rights. The principles and their 65 clauses, first conceived by the brother of DPRK founder Kim Il-sung in 1967, was officially initiated among the populace by Kim Jong-il in 1974. 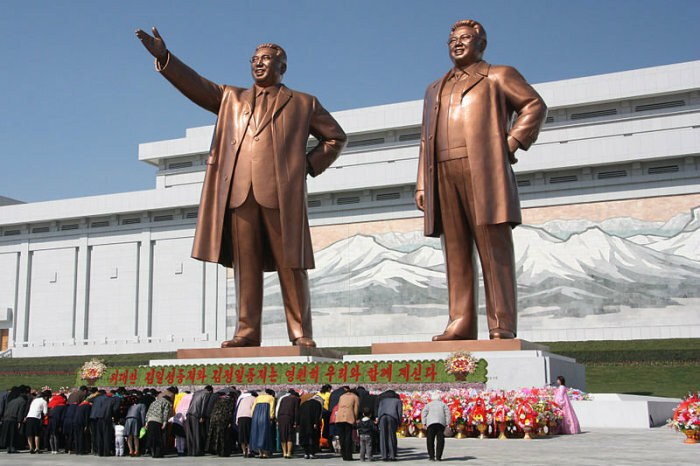 Reportedly among the principles meant to establish a Kim family personality cult and govern the thoughts and activities of North Korea's 24.7 million residents are directives to "accept the Great Leader Comrade Kim Il-sung's revolutionary thought as your belief and take the Great Leader's instructions as your creed" and to "respectfully worship our beloved Great Leader Comrade Kim Il Sung's sculptures, plaster casts, bronze statues, badges with portraits, art developed by the Great Leader, board with Great Leader's instructions, [and] basic mottos of the Party." Those who fail to obey state ideology find themselves, as do their complicit or innocent family members, facing capital punishment or a tortuous life inside one of North Korea's known six prison camps (No. 14, 15, 16, 18, 22, and 25). In Nov. 2013, there were reports that the government had publicly executed 80 people, some of them for being in possession of Bibles or watching South Korean videos. Despite once being known as the "Jerusalem of the East" due to a revival in 1907 that saw the rise of thousands of Christian churches and countless conversions, Christianity now appears to be enemy No. 1 in North Korea, despite its four, and allegedly fake, state-controlled churches in Pyongyang. "North Korea has long been one of the darkest and most isolated nations on earth, especially for believers. Kim Il-sung became 'Great Leader' of the Democratic People's Republic of Korea (DPRK) in 1948, after communists took control in the north. Almost immediately, he closed all churches and set out to eradicate Christianity. An estimated 300,000 Christians disappeared, and about 100,000 more were sent to labor camps. Nearly all pastors and priests were executed, adding to the number of martyrs who cry out to God for judgment," reads a report from Voice of the Martyrs, another persecution watchdog. The Juche doctrines, ironically, are reportedly based on aspects of Christianity, as the DPRK's founder and his son were raised in Protestant households. Kim reportedly took what he had learned as a Christian and twisted the faith's tenets to position himself as God and son Kim Jong-il as the son of God, with current leader Kim Jong-un rounding out the trinity. There is zero tolerance for outsiders accused of propagating contradictory ideologies in the country, with the most recent example being Christian missionary and U.S. citizen Kenneth Bae. Bae, whose family resides in Washington, was sentenced last year to 15 years in a hard labor camp for acts deemed threatening to the state. The China-based missionary, arrested in 2012 while working as a tour guide in North Korea, has been held by the government longer than any other detained U.S. citizen since the Korean War, according to International Christian Concern. "No one should ever face imprisonment or this type of treatment simply because of their religious beliefs, yet thousands upon thousands of men, women, and children are living in what has been described as hell on earth simply because they choose to be Christian," Isaac Six, ICC's advocacy manager, told Fox News on the one-year anniversary marking Bae's detention. "Our hope is that the world takes this highly unfortunate anniversary as an opportunity to wake up to what is happening behind the closed walls of North Korea and to call with one voice for an end to the atrocities being committed by Kim Jong-un's malignant regime." It is believe that there are about 200,000 people being tortured, killed, starved, or raped in North Korea's gulags, where the elderly and children, some of whom are born in these concentration camps, are counted among prisoners. "Former North Korean prison inmates and prison guards allege that religious prisoners are typically treated worse than other inmates. They are generally given the most dangerous tasks in the labor camps and are victims of constant abuse to force them to renounce their faith," the United States Commission on International Religious Freedom states in its 2013 report. Open Doors, Voice of the Martyrs, International Christian Concern, and Seoul USA are among several organizations working to help empower North Koreans and bring their stories to light.